Jim was born in East Peoria, Illinois in 1944. He graduated from East Peoria High School in 1962. He received his Bachelor's Degree from Bradley University in 1966. 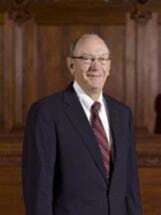 He graduated from the University of Illinois School of Law in 1969. Jim joined the law firm of Goldfine & Bowles, P.C. in 1980. In his 29 years with the firm, he has practiced in all areas of plaintiff's personal injury and worker's compensation.